I normally use a sacrificial fence when I cut rabbets on the table saw with my dado stack. There are a couple of good reasons for this. The dado stack can be recessed into the fence, which makes it easy to cut different width rabbets without always having to readjust the width of the dado head. The mdf is cut as long as the table saw fence and 6" high. Note the t-slot in the fence face. 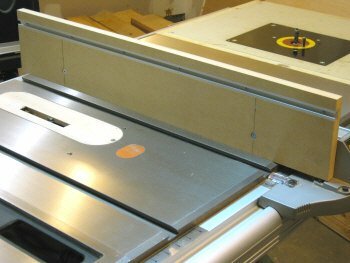 And two, a featherboard can be attached via t track to hold the workpiece against the saw's table for more uniform cuts, especially in thinner material like 1/2" plywood. My table saw fence has a t-slot on each side and two on top. This pretty much makes it a no-brainer as far as attaching the sacrificial fence goes. To make the fence, I cut a piece of 3/4" mdf 32" long (as long as the rip fence) and 6" high. Mdf is used because it's cheap, flat and easy to work with. The slot for the t track was cut next, positioned 3/4" down from the top. 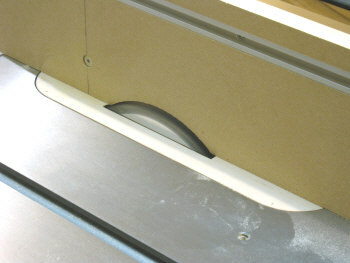 The slot can be cut on the table saw with a dado set or you can use a router. The sacrificial fence is mounted with countersunk screws. The t track is 3/4" down from the top. I measured up from the table to the middle of the t-slot in the fence and drilled two 1/4" mounting holes 6" in from both ends of the mdf fence. The holes were countersunk so the 1/4" taper head machine screws would sit below the surface of the fence. I was going to use 1/4" t-nuts in the fence slot, but they wouldn't fit (too wide), so I used regular 1/4" nuts instead. They worked fine. With the t track installed using six evenly spaced wood screws, I put the machine screws through the holes in the fence and turned the nuts on a couple of threads. The fence was then slid into position on the rip fence and the screws were tightened. What if I don't have t-slots in my fence? 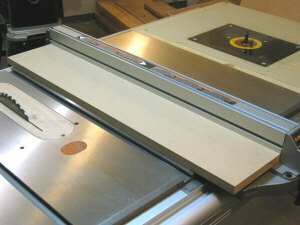 Many table saw fences don't come equipped with t-slots, and a different approach is necessary to attach an auxiliary fence to the table saw's rip fence. 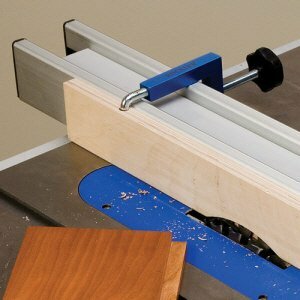 These Universal Fence Clamps from Rockler make attaching an auxiliary fence a snap. The photo on the left shows a set of universal fence clamps availabe from Rockler that can't get any simpler. A couple of holes are drilled in the edge of a straight piece of plywood, the clamps are inserted in the holes and the screws are tightened to pull the plywood into the rip fence. The part of the clamp that goes in the hole extends quite far inside, so it's not just pulling on the upper part of the fence, which could cause it to tip out of square with the table. The plywood must be the same height as the rip fence to work properly, so if you want a higher fence, you'll have to screw a taller fence directly to the one that's clamped. There are many other mounting methods that will work, such as building an "h" shaped unit that straddles the saw's fence, but none are as quick and easy as these fence clamps. The cost for a set of two is usually around fifteen bucks or less, which, when you consider the time and effort saved, is miniscule. They can be used to attach other jigs to the fence as well, so they'll no doubt find many uses in your shop over the years. Raising the dado blade to cut a recess in the mdf fence.The recess is 1/2" deep and 3/4" high. I'm going to cut a 1/2" x 1/2" rabbet in a workpiece, but first I'll have to set up the new sacrificial fence for rabbet cuts using my dado saw blade. To do this, I'll set the dado stack to 3/4" wide and tunnel into the mdf fence from below. With the dado head lowered below the table, I can position the sacrificial fence over the dado head, covering approx. 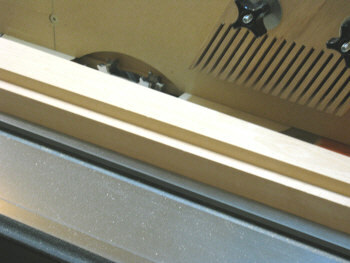 1/2" of the 3/4" wide dado blade. The fence is locked down and the dado cutter is raised into the sacrificial fence, cutting an arc about 1/2" wide (about two thirds the width of the dado head). I made the cut approximently 3/4" high, probably as high as I'll ever use, but it can be made as high as there is a need. 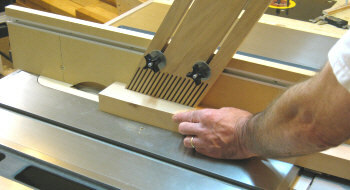 With the featherboard in place, a rabbet is cut in the side of this table leg. The rabbet is 1/2" x 1/2". The idea here is to provide a relief for the blade to sit in, making the width adjustment for the rabbet a matter of adjusting the fence in or out and not having to add or remove chippers and shims to the dado head to set the width. The photo on the left shows my set-up to cut a 1/2' x 1/2" rabbet. To set the width for this cut, I simply measured from the outer edge of one tooth on the dado blade to the outer face of the mdf sacrificial fence. I used my digital calipers to get an exact measurement. The rabbet looks great and is perfectly uniform. 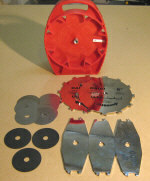 The featherboard is used to keep the workpiece planted firmly against the saw's table. A featherboard could also be used on the table to keep the workpiece against the sacrificial fence, but this table leg has a taper cut on one side, so it wouldn't work with this set-up. When I first started woodworking, I would cut my rabbets on the left side of the workpiece with the stock between the fence and the blade. It worked okay for thicker pieces, but would sometimes make a mess of thin plywoods. A cabinet maker showed me this method years ago, and I haven't looked back since. Learn more about the rabbet joint. Make your own wood featherboard. Use t track on your jigs and fixtures.